The Roll-In system for more efficiency. Well thought-out in every detail. 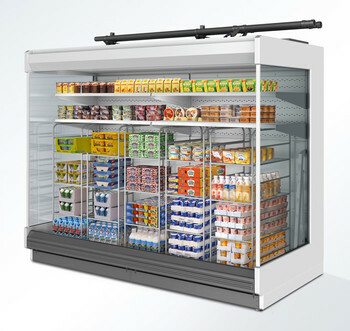 The VENTO ROLL-IN multideck allows considerably quicker loading and unloading and restocking of merchandise while using the available storage and display areas to the fullest. The roll-in system unburdens employees noticeably – lifting heavy products becomes a thing of the past. An unobstructed view onto the merchandise gives you more options for sales-promoting presentation. An optimized supply chain allows the rolling containers to be completely stocked prior to delivery, and the large loading volume makes maximum use of available store space.